Childhood, is that phase of the human life where almost everything is beautiful, everything is simple, everything is carefree, Childhood is a stage when almost everything, be it a habit, preference, mental or physical development can be shaped up and molded in a way, one would want. If life is a collection of seasons, childhood has to be the best season where one is less worried about how it affects them and rather enjoy what it has to offer. Childhood is full of happiness, enjoyment and delight whereas it is deprived of pride, ego and worries. This is how an ideal childhood would be, but is it same for all the kids? I recently read Grow Up Messy, a hilarious coming of age series book by author Paromita Goswami who has previously written a contemporary fiction book titled Shamsuddin's Grave and you can read the review of that book at Book Review : Shamsuddin's Grave - Paromita Goswami. The author Paromita Goswami is of the opinion that the world is full of stories and as a writer she would love to pen them down all, her writings are not genre specific and she writes from fiction to paranormal thrillers to children's books. You can connect with the author on Twitter at @authorparomita. 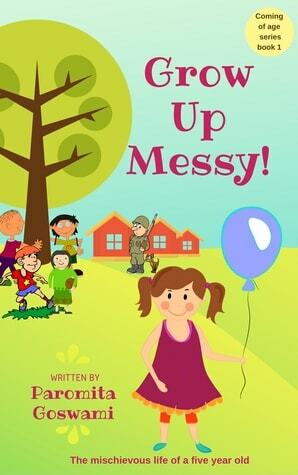 Grow Up Messy is the story of a five year old girl Misry and her adventures while she stays with her mother at the remote location of India-Bangladesh border in a BSF outpost. Why she stays there? You can already make a guess or simply find out while you read the book. Misry, in the new remote place, makes attempts to befriend kids from nearby villages as she has no friends and in her quest of being at par with the rural kids and their antics, she gets nicknamed as Messy for obvious reasons. Set in the early eighties, the story of Grow Up Messy is about her efforts to be a part of the gang, her failures, her successes and above all, the cuteness and the display of an adventurous explorer in that little girl. First of all, is Grow Up Messy a book for kids? Yes, it is an ideal read for kids and a great one to be read along with kids. But, I wouldn't limit it to only kids, almost everyone can read it for an interesting and a cute story line making you relive and crave for your own childhood. Grow Up Messy is full of funny moments with wit, laughs and smile at regular intervals which also have lessons about courage, presence of mind, smartness. It is a delightful read and takes you down the memory lanes, making you nostalgic if you have spent your childhood in the countryside or rural areas, disconnected from the craziness of the city, as we call them. The story of Grow Up Messy is as simple as it can get and uncomplicated making it a quick and easy read for kids and adult both. The narration of the book is unambiguous and straightforward, the characters are very real and the story, in a subtle way, is thought provoking. As a disclaimer, you may fall in love with Misry aka Messy!